In Bishwa Sahitya Kendra, Let’s Talk event took place on 8th July. 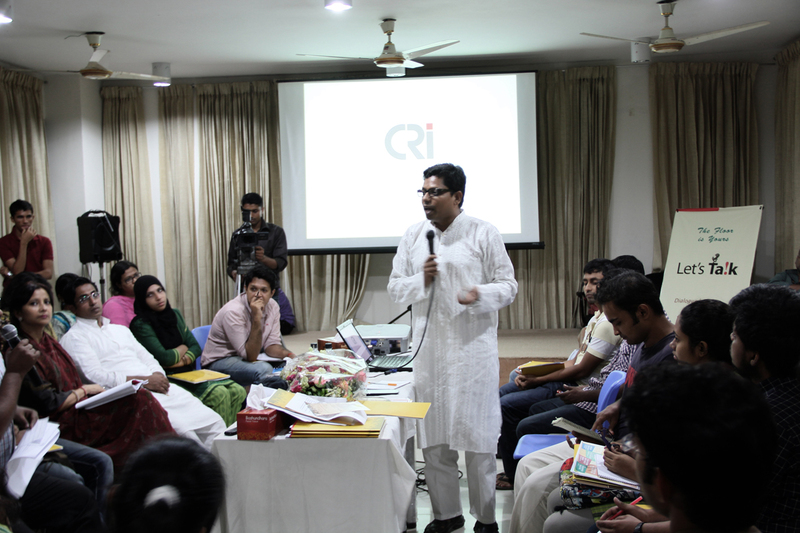 Nahim Razzaq MP, Tarana Halim MP and Junaid Ahmed Palak MP were present to talk with the participants. After the introductory session, questions were taken from the participants. Subjects like women rights, Padma Bridge, minister without Portfolio, War Crime tribunal, Disaster management, BCS quota, student council election, Yunus & Grameen bank, foreign policies were brought up by the attendees. Caretaker government has not done anything for the country. In Every indicator, Bangladesh failed to keep its pace in the two years of caretaker government, they commented. Tarana Halim MP said, “It’s a tragedy for us that whenever we achieve something good, a force in the name of religion hold us down.” About Hefazat issue, she said the opposition is trying to use manipulated photos and news to undermine the government. “Awami League ensured harmony in the country, stopped religious fanaticism and equal rights for all people”. She urged to put ‘ensuring women rights’ as one of the goals of Sustainable Development Goal. 1) There should be proper publicity of the things that the present government did. Awami League’s publicity cell should be more active. 2) Talk directly about the rumors. Hefazat, Padma Bridge, Dr. Yunus and other issues should be addressed and made clear in a unison. 3) Nominate the deserving candidate. 4) Stop taking political revenges but make government, law enforcing agency and judicial process strong to punish the culprits. 5) Ensure speed and efficiency in crime tribunals. 6) Make promises that you can keep and ensure accountability. 7) Resolve the internal conflict of Awami League. The three MPs thanked the youths for their participation and encouraged them to ask and to learn more. They also thanked CRI for organizing such events. A group photo was taken at the end of the discussion.